Tollywood actor Samantha Akkineni is counted amongst the leading actors of the South Indian film industry and never misses a chance of impressing her fans with her on-screen presence and her social media uploads. Recently, the actor shared her pictures where she is looking adorable dressed in a denim jacket and black jeans. With an ear to ear smile, the actor seems to nail her casual looks in her recent uploads. 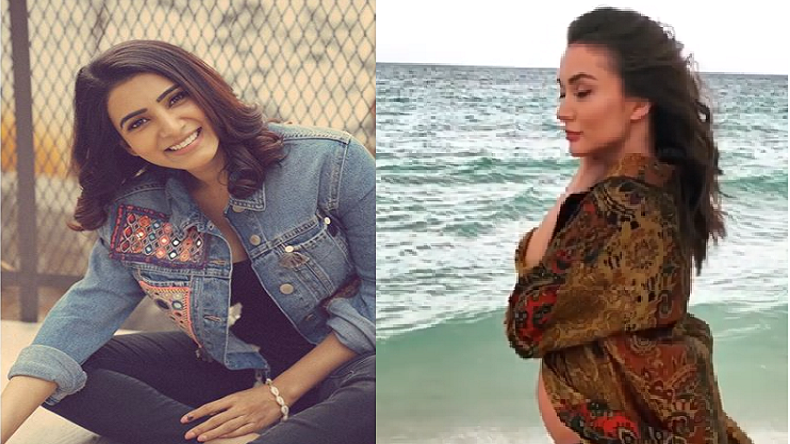 Talking about hardworking actor Amy Jackson, the hottie is currently enjoying a new phase of her life and has been 15 weeks pregnant now. It seems that the actor is very happy and leaves no chance of building new memories with her boyfriend George Panayiotis. Recently, the actor shared a video on Instagram where she is flaunting her baby bump in the most wonderful manner. In the video, the actor was seen enjoying the beautiful waves of the beach dressed in a hot black bikini and a printed pullover. Samantha commenced her career by taking up part-time modeling assignments and soon started getting film offers. The actor made her Telugu debut in the romantic film Ye Maaya Chesave in 2010. For her phenomenal work, her role in the film fetched her Filmfare Award for Best Debut Actress and a Nandi Award. Not only this, Samantha further became the second actor to win awards for Best Actor for Tamil as well as Telugu from Filmfare in the same year for her outstanding role in the film in Neethaane En Ponvasantham and Eega in 2012. Talking about Amy Jackson, the diva began with her modeling career while she was just 16 years old and won Miss Teen World competition in 2009. Further, the actor got an opportunity to appear as a lead lady in Tamil period drama film in Madrasapattinamin the year 2010. Some of her hit projects include Singh Is Bliing, Ekk Deewana Tha and 2.0 with Rajinikanth and Akshay Kumar.